8-9 Arlington (00 Marlborough) is located on the SW corner of Arlington and Marlborough, with 6 Arlington (0 Marlborough) to the north, across Marlborough. 10-11 Arlington to the south, and 2 Marlborough to the west. 8-9 Arlington were designed by architect Gridley J. F. Bryant, two of four houses (8-9-10-11 Arlington) designed at the same time. 9-10-11 Arlington were built in 1861; 8 Arlington, although designed at the same time, was not built until 1869. 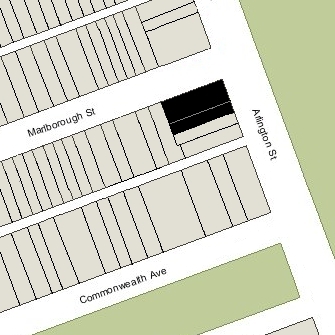 The four houses form a single symmetrical composition, with the two middle houses (9-10 Arlington) set slightly further back from the street than the two end houses (8 Arlington and 11 Arlington). The design complements similar pavilion-style French Academic designs at 1-2-3 Arlington and 4-5-6-7 Arlington. As originally built, there was a four foot wide passageway at the rear of 9, 10, and 11 Arlington, running parallel with Arlington, to provide access to the alley for all four houses. The land on which 8-9 Arlington were built was among several lots purchased from the Commonwealth of Massachusetts on December 9, 1858, by Deming Jarves and by his son-in-law, Oliver Brewster. Click here for indices to the deeds for 8 Arlington and 9 Arlington and for a plan of the original land. Deming Jarves was the founder and agent for the Boston & Sandwich Glass Company. He and his wife, Anna Smith (Stutson) Jarves, lived at 64 Boylston. Oliver Brewster was an insurance actuary and agent. He and his wife, Anna M. (Jarves) Brewster, lived at 61 Charles. Oliver Brewster acquired his father-in-law’s land at the corner of Arlington and Marlborough on December 10, 1860. He consolidated it with land he owned to the south and west, creating two lots: a 47’-by 110’ lot on the corner of Arlington and Marlborough (where 8 Arlington would be built), and a 20’-by-110’ lot immediately to the south (where 9 Arlington would be built). At about the same time, he sold portions of other land he had bought from the Commonwealth to the owners of the lots where 10 Arlington and 11 Arlington would be built. The houses at 9-10-11 Arlington were built in 1861. The corner lot at 8 Arlington remained vacant (although the original plans included it) and on March 11, 1863, Oliver Brewster sold the lot to John Foster. As part of the sale, it was agreed that any house built on the lot would conform with Gridley J. F. Bryant’s design, and a copy of the elevation drawn by Bryant was recorded with the deed. John Foster held the land until March 21, 1868, when he sold it to Barney Cory. 8 Arlington was built in 1869 as the home of Barney Cory and his wife, Eliza Ann Bell (Glynn) Cory. They previously had lived at 1225 Washington. He was a wine importer and merchant. The Corys’ daughter, Jennie Louise Cory, and son, Charles Barney Cory (later a noted ornithologist and Olympic golfer), lived with them. Jennie Cory married in June of 1881 to tea importer Edward Royall Tyler and moved to 369 Marlborough, owned by her father. Barney Cory died in August of 1882. 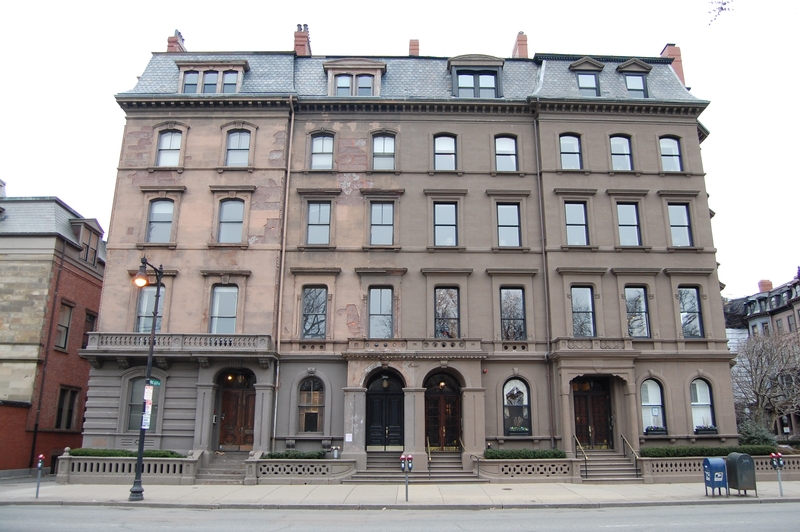 8 Arlington, 369 Marlborough, and a number of other properties were inherited by Jennie Louise (Cory) Tyler and Charles Cory, each with a 50 percent undivided interest. On January 13, 1883, Jennie Louise Tyler established a trust to hold her properties, with Otis Everett Weld and Francis Clarke Welch as trustees. On May 8, 1889, the trust transferred the property to Edward and Jennie Tyler, and they transferred it to a new trust for their benefit and the benefit of their children, with the same trustees. Jennie Tyler died in April of 1890. Eliza Cory and Charles Cory continued to live at 8 Arlington. Charles Cory married in May of 1883 to Harriet W. Peterson, after their marriage, they lived at 8 Arlington with his mother. Eliza Cory died in 1892. Charles and Harriet Cory moved soon thereafter to Yarmouth. 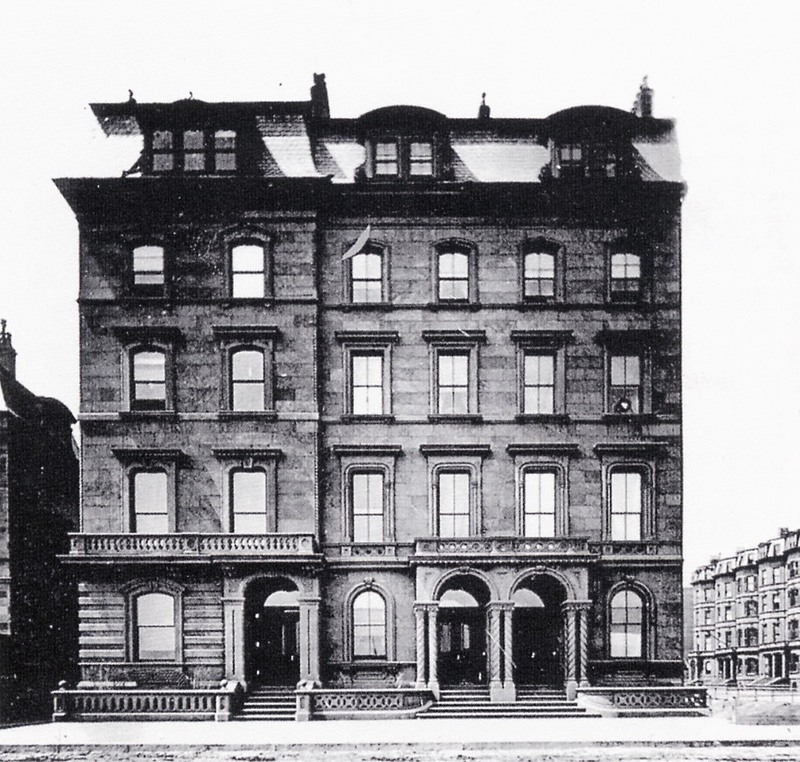 On October 1, 1892, Charles Cory transferred his half interest in 8 Arlington, 369 Marlborough, and several other properties to the Tylers’ trust (at the same time, the trust transferred its half interest in several other properties to him). The Tylers’ trust continued to own 8 Arlington until 1919. 8 Arlington was not listed in the 1894 and 1895 Blue Books. By 1894, 8 Arlington had become a sanitarium operated by the German Remedy Company of Massachusetts, offering “first-class hotel accommodations” to those under treatment for their addiction to liquor or drugs. 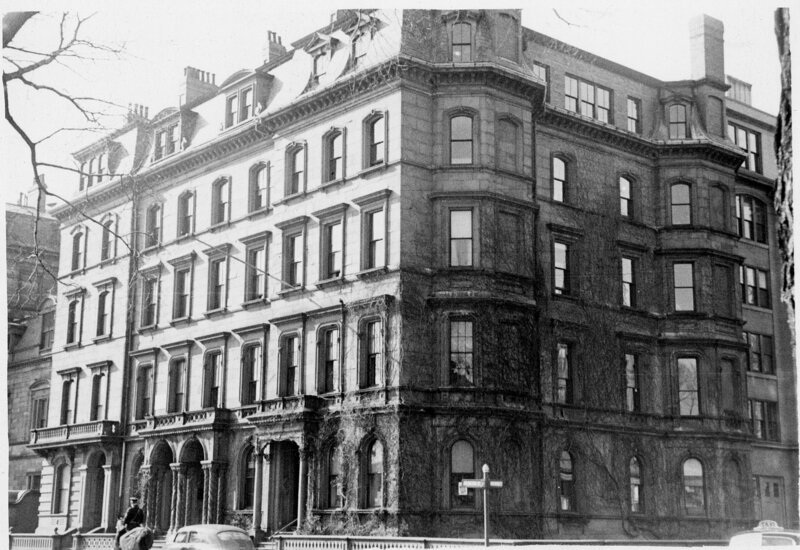 The firm also maintained offices at the Hotel Pelham (southwest corner of Tremont and Boylston). By the 1896-1897 winter season, 8 Arlington was the home of Miss Irene Stearns, who operated it as a lodging house. She continued to live there until about 1902. 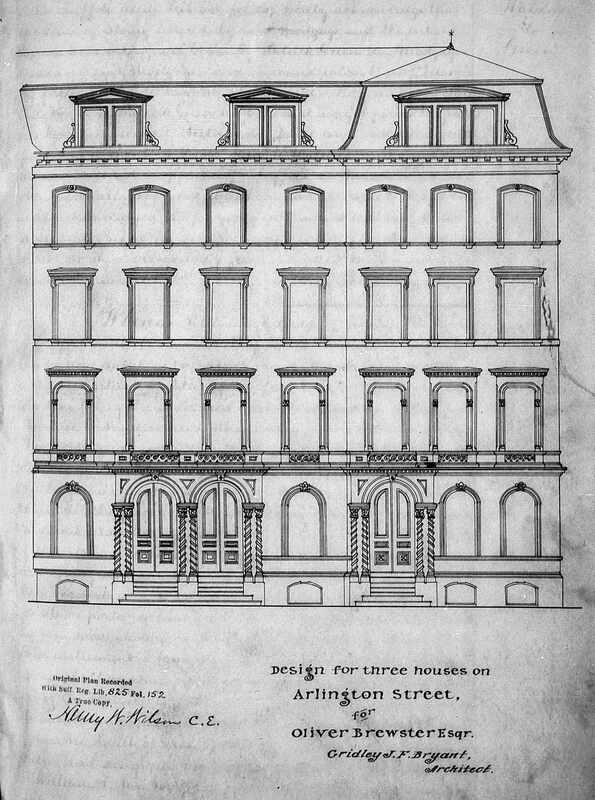 In September of 1905, Francis C. Welch, trustee of the trust established by Jennie Louise Tyler, filed for permission to construct a ten-story commercial building, 25 feet wide and 105 feet long, apparently at the corner of Arlington and Marlborough Streets on the portion of the lot for 8 Arlington not occupied by the existing building. The application was denied. By the 1907-1908 winter season, 8 Arlington was the home of Mary A. (Fraser) Wright, the former wife of Denison A. Wright, who operated it as a lodging house. Her son-in-law and daughter, Seward B. Livermore, an electrical engineer, and Margaret Eva (Wright) Livermore, and their children, lived with her. Seward Livermore died in November of 1909. Mary Wright and her daughter and grandchildren continued to live at 8 Arlington in January of 1920, but moved thereafter to an apartment at 405 Marlborough (where Mary Wright was living at the time of her death in July of 1920). On July 8, 1919, The Atlantic Monthly Company purchased 8 Arlington from E. Sohier Welch, successor trustee of the trust established by Edward and Jennie Tyler. Later that month, it acquired 9 Arlington. 9 Arlington was built in 1861 as the home of insurance actuary and agent Oliver Brewster and his wife, Anna M. (Jarves) Brewster. They previously had lived at 61 Charles. On January 3, 1866, Oliver Brewster transferred 9 Arlington to a trust he established with his brother-in-law, Rev. Christopher Toppan Thayer, as trustee. Christopher Thayer and his wife, Augusta (Brewster) Thayer, lived at 131 Beacon. Oliver Brewster died in October of 1868. Anna Brewster continued to live at 9 Arlington in 1869, but moved soon thereafter. On October 26, 1869, 9 Arlington was purchased from Christopher Thayer, trustee, by James Walker Austin. James Austin was an attorney. In the early 1850s, he had gone to Hawaii, where he practiced law. After his marriage in July of 1857 to Ariana Elizabeth Smith Sleeper, they lived to Honolulu, where he served as a member of Parliament and, from 1868, as Judge of the Supreme Court. He probably purchased 8 Arlington in anticipation of returning to Boston. By 1870, 9 Arlington was the home of Martin Brimmer and his wife, Marianne (Timmins) Brimmer. They previously had lived at 48 Beacon. A lawyer by training, Martin Brimmer had never entered active practice. He had served as a member of the Massachusetts House of Representatives in 1859-1861 and of the State Senate in 1864. He also served as president of the Museum of Fine Arts. 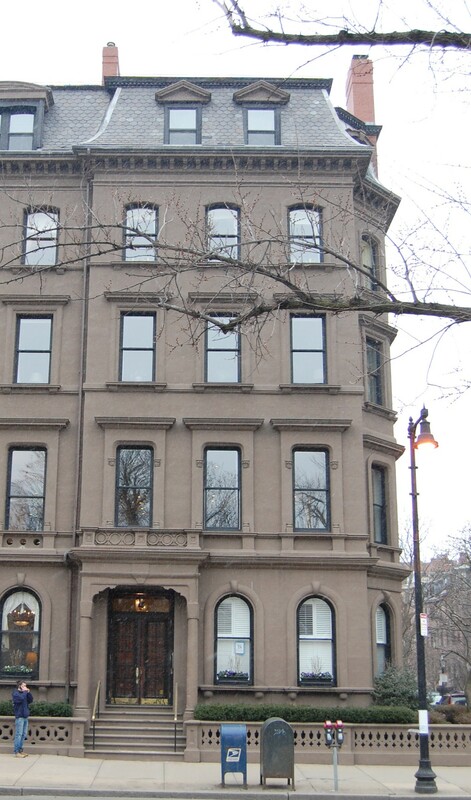 The Brimmers continued to live at 9 Arlington in 1872, but by 1873 had moved to 47 Beacon. The Austins returned from Hawaii to Massachusetts in 1872 and made 9 Arlington their home. Their children lived with them: Herbert Austin, who would become an iron and steel dealer; Walter Austin, who would become an attorney and author; William Francis Austin; and Edith Austin. William Francis Austin died in July of 1886. Herbert Austin married in April of 1890 to Virginia Pegram, and they moved to 227 Marlborough. Virginia Austin died in May of 1892, and Herbert Austin moved back to 9 Arlington to live with his parents. James Austin died in October of 1895. Ariana Austin continued to live at 9 Arlington with Herbert, Walter, and Edith Austin. Walter Austin married in June of 1897 to Mabel Lindsley Frazer and they moved to an apartment at 199 Marlborough. Ariana Austin died in July of 1911. Herbert and Edith Austin continued to live at 9 Arlington in 1913 but moved thereafter, probably to Marion, where they were living at the time of the 1920 US Census. During the 1913-1914 winter season, 9 Arlington was the home of Mrs. J. L. Hurley. By the 1914-1915 winter season, 9 Arlington was the home of Clarence G. Tompkins, an electrical engineer, and his wife, Nina (Ward) Tompkins. They previously had lived at 81 Mt. Vernon. They may have operated 9 Arlington as a lodging house. They continued to live there during the 1916-1917 winter season, but moved thereafter 10 Newbury. 9 Arlington was not listed in the 1918 or later Blue Books. On July 23, 1919, The Atlantic Monthly Company purchased 9 Arlington from Herbert, Walter, and Edith Austin. It had purchased 8 Arlington earlier that month. After acquiring 8 and 9 Arlington, The Atlantic Monthly Company converted the two buildings into their general offices, which they remained for the next 79 years. 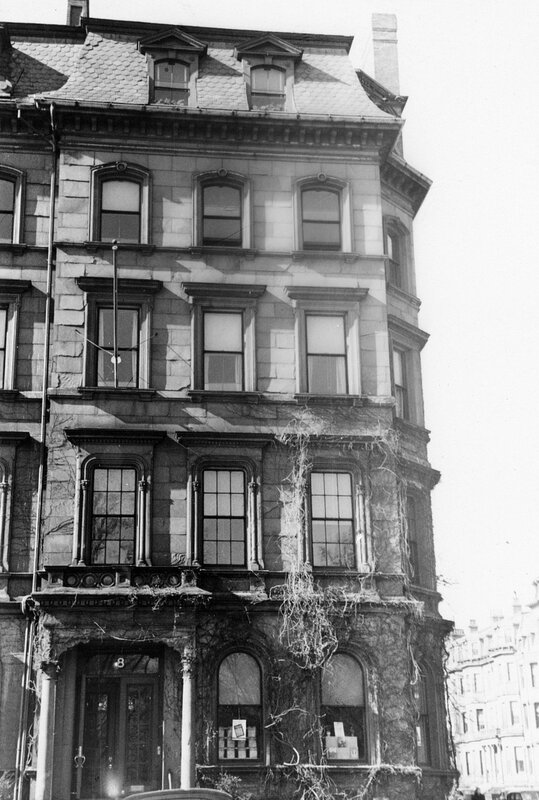 In March of 1923, The Atlantic Monthly Company applied for (and subsequently received) permission to build a six-story rear addition, designed by the architectural firm of Kilham, Hopkins, and Greeley, in the open space at the rear of the building, on Marlborough (later known as 00 Marlborough). 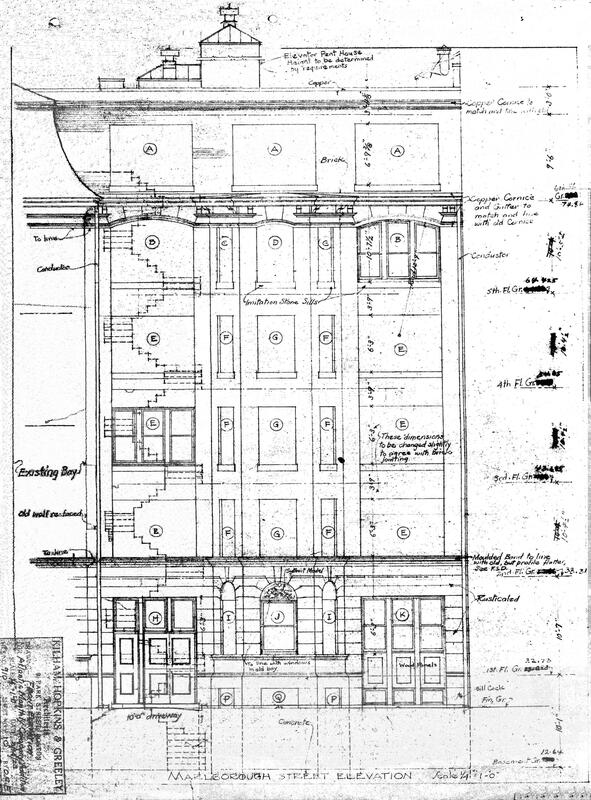 Architectural plans of the building — including elevations, floor plans, and foundation and framing plans — are included in the City of Boston Blueprints Collection in the Boston Public Library’s Arts Department (reference BIN G-58). In September of 1927, The Atlantic Monthly Company had acquired 2 Marlborough. In November of 1939, The Atlantic Monthly Company was sold by its owner, Ellery Sedgwick, to Richard Ely Danielson of Boston, president and editor of The Sportsman. On November 23, 1939, as part of the transaction, Ellery Sedgwick acquired 8-9 Arlington and 2 Marlborough from the company. It continued to lease the properties as its offices. On July 11, 1944, 8-9 Arlington were acquired from Ellery Sedgwick by Ruth Cimerblatt (he had sold 2 Marlborough separately, in April of 1944, to S. Clifford Speed). On August 8, 1946, the HCB Realty Company acquired 8-9 Arlington from Ruth Cimerblatt, and on August 8, 1966, The Atlantic Monthly Company re-acquired the property from HCB Realty. In 1980, The Atlantic Monthly Company was purchased by Mortimer Zuckerman of Boston Properties. The magazine retained its offices at 8-9 Arlington. Boston Properties also moved its offices to the building and rented space to other business tenants. On November 27, 1980, 8-9 Arlington was damaged by a fire which originated at 10-11 Arlington, the offices of Harbridge House, an international management consulting firm. On May 1, 1981, The Atlantic Monthly Company sold 8-9 Arlington to The Atlantic Monthly Trust (Mortimer Zuckerman and Robert DeGaeta, trustees). In 1986, Mortimer Zuckerman sold The Atlantic Monthly publishing company, but remained trustee of The Atlantic Monthly Trust, which owned 8-9 Arlington. The magazine continued to be headquartered at 8-9 Arlington until December of 1988, when it moved to Boylston Street. Boston Properties continued to maintain its offices at 8-9 Arlington and to lease space to others. 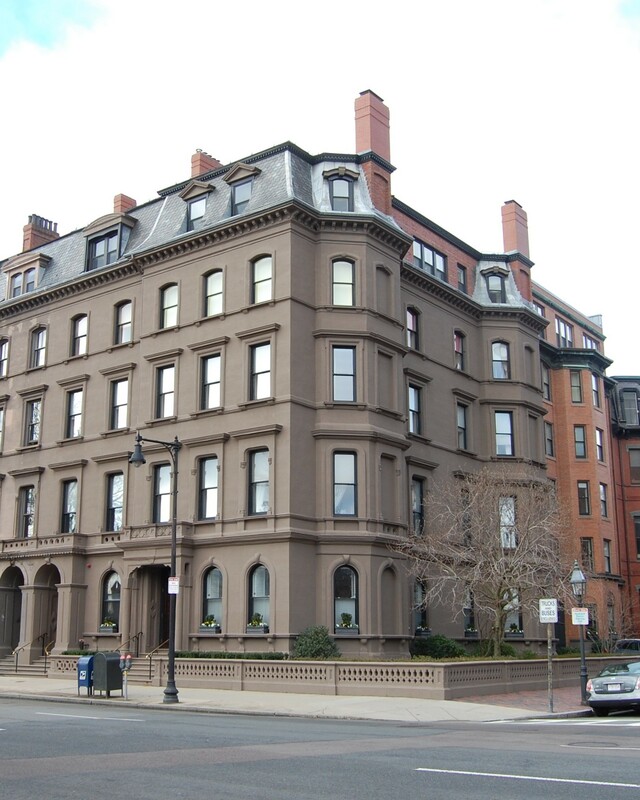 On December 14, 1999, The Atlantic Monthly Trust sold 8-9 Arlington to the Eight Arlington Street LLC. In 2000, the new owners remodeled the building into six apartments and a garage. 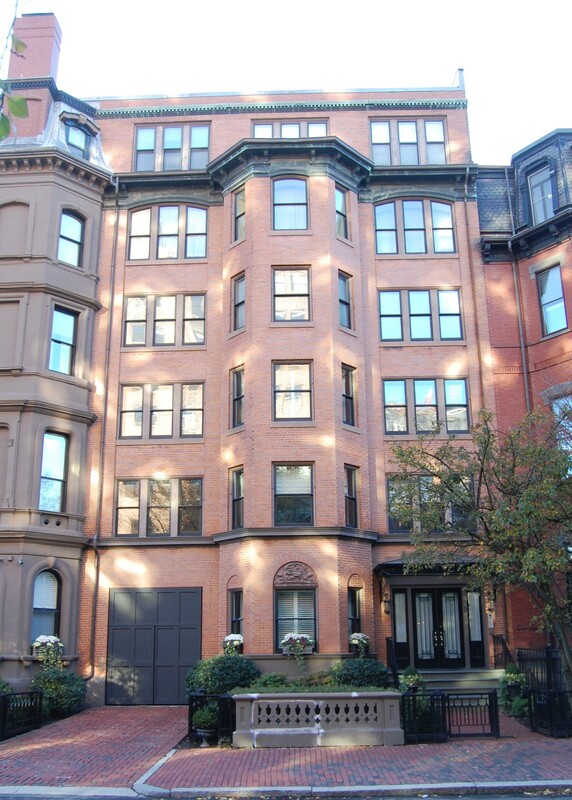 On June 21, 2001, the Eight Arlington Street LLC converted the apartments into six condominium units, the 9 Arlington Street at the Public Garden Condominium.